There’s a primary election for governor on August 14. And there’s a Westporter on the ballot. Steve Obsitnik is that candidate. A Connecticut native, Naval Academy graduate, entrepreneur and CEO, he got enough votes at the state Republican convention to battle the party’s endorsed candidate, Danbury mayor Mark Boughton. Obsitnik’s name might be tough to remember (and spell), but he’s familiar to local residents. He was president of the Westport Weston YMCA, served on the Republican Town Committee, is involved with the Saugatuck Rowing Club — and in 2012 he ran his first political campaign, against incumbent Congressman Jim Himes. Obsitnik’s RV — covered with signatures and words of encouragement — is familiar around town too. The other day it was parked in the Imperial Avenue lot. The candidate pulled out 2 lawn chairs, invited me to sit down, and chatted about himself and his campaign. 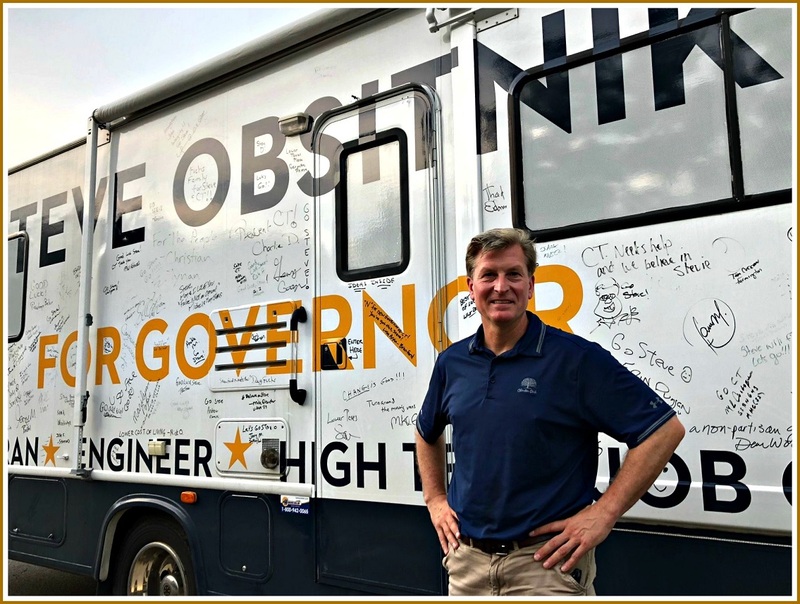 Among the signatures on Steve Obsitnik’s RV: Ned Lamont, the Democratic Party-endorsed candidate for governor. He’s a Stamford High School graduate and soccer player who still has nightmares of Mike Clifford leading Staples to an 8-0 drubbing. Obsitnik was recruited by top schools, and won an appointment to Annapolis. Vision issues limited his collegiate career, so he concentrated on engineering (and graduated with honors). He spent 5 years as a nuclear submarine officer, earning 8 medals for distinguished service. He served in Groton and South Carolina, and the Mediterranean during the first Gulf War. He also chased Russian subs under the North Pole. She got a job with Bain Capital (and now heads their retail consumer products practice). He joined the Stanford Research Institute, helping create technology for the government. 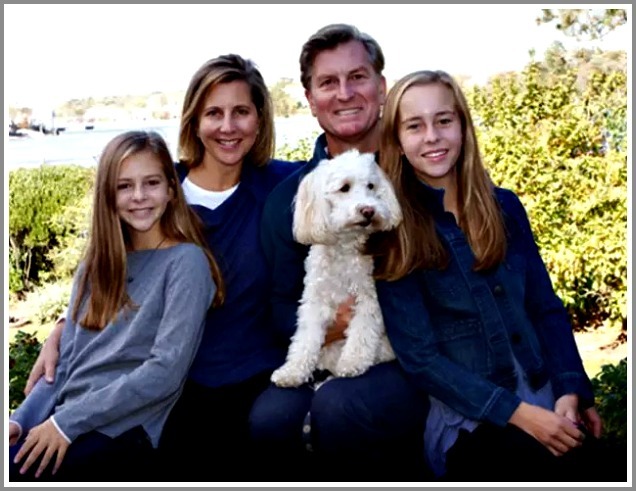 Steve Obsitnik, his wife and daughters. Moving on to Sarnoff Labs and Qinetiq, Obsitnik helped create products like video on demand, artificial intelligence — and Siri. In 2005 — after 4 years in Minnesota — he and his wife felt it was time to “come home.” They moved in with her parents on Imperial Avenue. When he started Quintel, which manufactures smart antennas, he realized that despite all Connecticut offered, it lacked the ecosystem to develop and sustain companies like his. In 2011, after a 2-day trip to India, he suffered a pulmonary embolism. His 2 daughters were young. He reassessed his work-life balance, while wondering how he could put his entrepreneur and engineering skills to work to help his state. After his Congressional defeat the next year to Himes, Obsitnik started Imagine Connecticut, a non-profit whose goal was to make this a Top 10 job-creation state within 10 years. His travels took him to every corner of Connecticut. He listened and learned about economic, infrastructure, transportation and education concerns. Having lived in 4 state zip codes — and looking at the field of gubernatorial candidates — he threw his hat in the ring. Obsitnik’s big vision: create 300,000 jobs in 5 years. A primary election is very different from the general. Republicans make up just 23% of voters statewide, Obsitnik says — and only 100,000 generally vote in primaries. Advertising in this area — the New York market — is prohibitively expensive. So he’s organized a ground game. He’ll knock on as many doors as possible. He will follow the Mitchells model: find your customers, “hug them” and hold them. Obsitnik is unfazed by his party affiliation. He points to the job creation efforts of Massachusetts’ Republican Governor (and former businessman) Charlie Baker as a model. “I’m a military veteran. I support our commander-in-chief, whether it’s Barack Obama or Donald Trump,” the Westporter says. It’s a message Steve Obsitnik will repeat all around the state, every day through August 14. And, he hopes, all the way to November 6. FUN FACTS: Westport State Representative Julie Belaga won a Republican primary, and ran for governor in 1986. She lost to Democratic incumbent William O’Neill. Westport Republican John Davis Lodge served as Connecticut governor from 1951 to 1955. 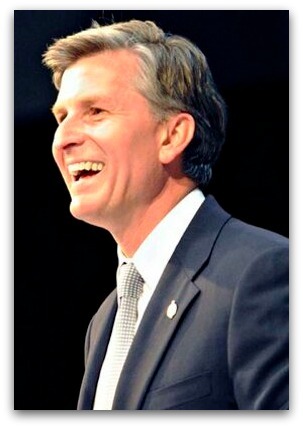 This entry was posted in Economy, People, Politics, Sports, Transportation and tagged Connecticut gubernatorial primary, Steve Obsitnik, Suzanne Tager. Bookmark the permalink. Great writeup, Steve is a good man! This election is about Connecticut’s economic issues AND about Trumps policies. And times have changed – supporting any president out of duty when the current president is leading the country down a path of anger, hatred, racism, authoritarianism and corruption is not right. It is not supposed to be a government for corporations but a government for the people. Republican candidates need to stand up, be counted on these social issues and not simply avoid the massive shift in civility in this country by focusing solely on economics. Connecticut voters can handle a discussion about both. I should add- Steve is an excellent candidate – look forward to hearing more! There in no doubt. Steve is a great candidate and Connecticut needs his leadership and goals for our future! Leave Trump and his politics out of our Connecticut politics. The Democrats have dismantled and destroyed our state economy. How could we have “invented” the hedge fund industry, minted billionaires, and be on the verge of bankruptcy? The Republicans haven’t done much better, whether its corrupt State leaders or a sitting President who has targeted us with his “tax reform”. But how about we just worry about Connecticut for a change? It’s a complete mess, partisan politics haven’t gotten us anywhere in the past 30 years and they sure won’t do much for us now. Nonsense about leaving Trump out of Conn. politics. Conn. is part of the American Republic that Trump is dismantling. ANY Republican who has not openly taken Trump to task on his unimaginable agenda, cabinet and press secretary, is not to be trusted or voted for. I suspect those commenters here who insist on bringing Trump into this CT governor election (and cannot help but spout anti-Trump rhetoric when mentioning his name) are of the “cannot cast a vote for a Republican even if he is my friend / neighbor / a fantastic candidate / etc.” mindset – that’s fine, but I have never had any luck holding a reasoned, fact-based discussion about CT and how should address the severe crises we are facing here at home. But for the rest of you, D, R or I, I strongly suggest you consider Steve Ositnik and his message; he is a strong candidate with a clear vision to lead us out of this mess we find ourselves in. Nice to have a qualified candidate to choose from. He’s got my vote! Let’s also add the $2 million reduction in funding for senior citizen food program in CT proposed by this same democratic Governor. All one has to do is examine the VOTING RECORDS of our current Republican representatives (Boucher, Hwang) in Hartford, one will see they are marching in lockstep with the Trump Republican Party – which has NO American’s better interests at heart, or in mind. As far as CT’s current fiscal problems, one only has to look back to the era of the criminal REPUBLICAN Rowland (incarcerated now – for the SECOND time), to see the start of nefarious activities which bring us to this point in time. The Democrats I have met all have intelligent, productive, realistic, long term solutions to very complex and nuanced issues – and are working to support opportunity for ALL of Connecticut’s residents, especially those who are being marginalized under trump-ist policies (POC, LBGTQ, immigrants, women). So, all the yelling, badgering, attacks and fear-mongering by certain loudmouth Rethuglican misogynists will not convince this UnAffiliated voter otherwise. My advice to Steve Obsitnik: start your own political party if you want to make a run of it – cuz the Republican Party – the one whose candidates I have voted in years past – is DEAD. CT close to running out of borrowing capacity-just $179.736 million of debt capacity remaining. From the CT Office of the Treasurer report dated July 1 2018: “As of July 1 2018, the aggregate amount of net indebtedness so computed is 89.29% of the (CT) debt limit. As set forth in said section, should the aggregate of net indebtedness reach 90% of the debt limit, certain actions are required to be taken by the Governor’s Office”. The decision by the Governor and Treasurer of CT to assume The City of Hartford debt added hundreds of millions to CT’s debt. The City of Hartford guaranteed debt, known as Hartford Contract Assistance, has added to the State of CT Indebtedness an additional $531,560,000 in debt. Just The Facts. The report is released by the State of CT Treasurer and can be found on the CT Office of Fiscal Analysis website. Happy to share the report. Just the facts. Is MONEY the only consideration for you guys, for Christ’s sake. What about just the latest travesty of Tump’s selling out to the baby formula industry by not going along with the international “breast feeding” bill and threatening to stop trade and support for nations that sponsor the bill. Taxes are not the sins Republicans make them out to be; nor are deficits. Trump is the sin. Daniel. I don’t like Trump. Not al all. But I love CT too much to see the party that is destroying our great state stay in power. I will put CT ahead of Trump and Washington. I hope many do the same as we watch our home prices fall and fall. The Connecticut Economic Digest, July 2018. Problem? Is it a Sector Problem? experienced job growth of 12.5%. all jobs lost during the recession. or real, gross state product. Lisa-do you call the Democratic Party in CT fiscal responsible? Really? You are better off calling them the State Worker Party as that is all they care about. More to consider when voting for the next Governor of CT in the fall. Just the facts about the massive problem caused by Governor Malloy and Democratic legislators in CT including Rep Steinberg. Westport I strongly suggest paying attention, these are real numbers, and a negative impaCT on our schools and property values at stake. Where will this money come from as CT is a constitutionally mandated balance budget state. That adds up to $11.14 BILLION–thats over $11 billion. Where will the money come from to balance the budget each year? I do believe that any candidate for elected office should comment on Donald Trump in a substantive way. I do not think it will hurt a Republican with most individual voters publicly to express disdain for Donald Trump. The most likely Republicans to be bothered by a disavowal of Donald Trump are those who are tied into party politics in some manner, e.g. as party leaders or as large donors who seek to use their donations to influence policy. For any candidate to ignore what I believe Donald Trump is doing to our nation reflects badly on the judgmental ability of such a candidate. If any candidate sees good in Donald Trump that should be stated as well. Don. Should the same go for people voting? Should people consider the record of a candidate and decide how they will vote no matter the party affiliation? Should people hold a candidate responsible for the fiscal crisis in CT and then vote not by party but by outcome and voting record?